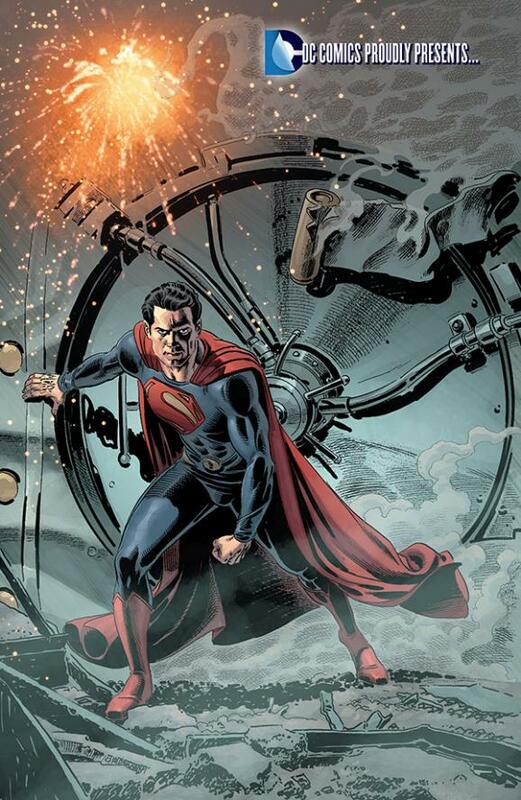 "Man of Steel - The Prequel"
Our story opens with a scene that is all to familiar. A kindly couple finding a baby from a crashed rocket. It is from here, instead of going forward, we flash back in time, before the rocket came to Earth, to the planet from which it left. We find ourselves some time ago, on the planet Krypton. Somewhere in the wilderness of the planet, as six young individuals go through survival training. Leading the group is a young woman by the name of Kara Zor-El. The six young Kryptonians named Kara Zor-El, Kell-Ur, Dev-Em, Nam-Ek, Dora and Thara (2 female and 4 males) are pilots in training for a mission to the stars. As Krypton's leaders, led by a high council has decided to branch out to other worlds. Kell-Ur, one of the six, questions as to why the council felt it was necessary for them to go through such rigorous training. He is reminded by Kara, that it is to simulate possible harsh conditions that the explorers guild could possibly encounter on other worlds. They continue on their journey, as they attempt to head toward three beacon signals that would have them complete their journey and training exercise. Their training takes them high on top of a dormant volcano, in which they cross through, and then find themselves in a crystal swamp and finally through a cave clearing. Once there, Kara decides that they should split up into pairs so to complete the task quicker, as each team would go locate one beacon each. She assigns Kell-Ur to go with Dev-Em, Nam-Ek with Dora and Thara with herself. Dev-Em protests to why he should listen to Kara, she replies that she kept the group alive all this time in their travels through the harsh conditions of their journey, and that the task that they are on is a timed trial, meaning, if they are to complete it in time, they need to move faster, and that is why they are being split into teams of two. Once each team deploy in search of their assigned beacons, Thara asks Kara if it was truly wise to split the group up, as only four of the six members will pass and be selected. Kara replies that they have a better chance if they all work together instead of competing against one another. Kara and Thara find their beacon and retrieve it. Then they here a loud scream. Kara recognizes the voice as Kell-Ur's and runs toward it. Once she gets to him, she finds Kell-Ur holding onto the side of a cliff, with blood dripping from his forehead. 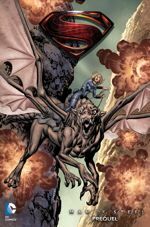 Kell-Ur is out of Kara's reach, Kara yells for Thara, asking for the ropes that he is carrying in his backpack, but there is no answer from him. Kara tries using an old branch to see if she can get it in kell-Ur's reach, but to no success. Kell-Ur trying hard to hold on, then discovers a snake slithering along the rocks to which he is holding onto. The snake bites Kell-Ur on the hand and he sadly falls to his death. Kara screams in horror at the sight of her teammate falling to his death, and flashbacks to the two of them in an intimate moment together, where it is revealed that they were more than teammates or friends. Kara and Kell-Ur were in love with each other, and planned to be together as they traveled and explored new and different worlds together. Dev-Em appears shortly after, saying that he and Kell-Ur got separated as they searched for their beacon. Kara accuses him of lying, saying that she can see Kell-Ur's blood on his hands, Dev-Em in a panic looks to his hands and clothes, then realizes that Kara out witted him and trick him into revealing that he was indeed responsible for Kell-Ur hanging off the side of the cliff. Dev-Em charges toward Kara with a large survival knife, explaining how the chances of him passing this trial are about to get even better. 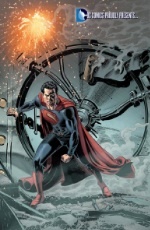 He attempts to kill Kara, but Kara manages to best him in hand to hand combat, and manages to knock him unconscious, and then binds him up, so not to have him attack when he regains consciousness. The rest of the crew finally find Kara, and she calls for a transport to pick them up. Later we find Dev-Em standing trial for his crime in front of the council. The 5 council members sit atop seats that look down at the accused. Dar-Enx, one of the council members reveals that after five weeks of deliberation the council finds Dev-Em guilty of assaulting Kara Zor-El and murdering Kell-Ur. It is also revealed that this is the first murder to happen in a thousand years on Krypton. Dar-Enx sentences Dev-Em to death for his heinous crimes, but is apposed by two members of the council Syra and Ten-Ar. They explain that Kryptonians are not barbaric like the Thanagarians and they do not live by the code of "An Eye For An Eye or A Life For A Life". Dar-Enx somewhat startled by this, asks the remaining two council members if they agree with the sentiments of Syra and Ten-Ar, they both concur that they do, and Dar-Enx sentences Dev-Em to remain in their custody, indefinitely. We then find ourselves at a ceremony, where Kara Zor-El is presented with one Krypton's highest distinctions "The Star of Rao". She is given this great honor for her impeccable scholastic record and also subduing and capturing Dev-Em. Speaker Kawl, who presented Kara with the award then reveals that within the next hour, all those that passed the tests that they had been tasked with would be assigned a ship, that would take them to the stars and to new and different worlds. He reminds them that they carry Krypton's future, memories and legacy with them, as they travel to far away stars. After the ceremony, Kara meets with her parents Zor-El and Alura, as they congratulate her on her achievements. Kara invites her parents to see the ship that she has been assigned. Once their Kara explains that each ship carries a "Growth Codex", after exploring the immediate area, the codex will be activated and the Embryos inside will gestate, and soon after, there would be an entire Kryptonian population that would help with the "Terra Forming" of the planet. Kara explains that there is over a thousand ships that will launch and this would be the start of Kryptons "Great Age Of Expansion". Zor-El and Alura say how proud they are of Kara, and present her a gift from the both of them. It is a "Sun Stone," a very rare rock on their side of Krypton. It projects an image of Kell-Ur and Kara hugging one another, Zor-El explains that the image was provided by Kell-Ur, that he had said it was a happy memory that they both shared. Kara sheds a tear of happiness and remembrance, embracing her parents, telling them how much she loves it. We cut to the launching of the ships. Kara Zor-El sits in her cockpit/command chair as the ships begin to take off and head to the starts. While on the ground two guards who armed with restraints and weapons, head toward Dev-Em's holding cell. They talk amongst each other, how the first murder on Krypton in a thousand years needed to also be followed by the first execution. They arrive at the cell, only to find it empty. The ships leave Krypton, and Zor-El and Alura watch from the ground. Alura says, "We will never see her again will we? ", only to be comforted by Zor-El. They revel in the accomplishments of their daughter, and watch on proudly. On the ship, the crew get ready to go into Cryo-Sleep. Their projected time of travel is 10 years to their destination. They set everything up and each one enters their pods, in which they will rest for the next 10 years. Kara is the last to go to sleep, after she finishes checking up on the crew, she seals herself into her stasis pod, sets the controls, and goes to into Cryo-Sleep. Just as Kara does so, a shadowed figure emerges and enters the room. We next find ourselves back to a similar situation, as Kell-Ur hanging desperately from the edge of a cliff, calling out to Kara for help. Kara uses an old broken tree branch to try and get Kell-Ur to grab onto it, so he can pull himself up, the branch proves to be just a little too short, and Kell-Ur again falls to his doom... Only this time Kara dives in after him... She manages to get a hold of Kell-Ur, and fly him to safety. Once they reach the top of the mountain, Kell-Ur asks Kara how she did that, and embraces her as he thanks her, and explains that it was Dev-Em that pushed him off the cliff. Kara says nothing, save but smiling as she and Kell-Ur bask in the rays of a yellow sun. At that very moment Kara has a rude awakening from her Cryo-Sleep, like someone who wakes from a terrifying dream. Kara then exits her pod, and sees that the other pods are empty. She calls out to her crew, but no one answers. She then examines some loose wiring at the bottom of one of the pods, as if it wear ripped out deliberately. Kara suits up, and heads to the control room of the ship, she can hear a voice coming from there. Once she gets there she sees the crew sitting at their stations, suited up in their astronaut exploring gear. As she gets close, she discovers that the whole crew is dead, and by the looks of it, they have been dead for quite some time. All the bodies sit at their stations, rotting inside of their suits. Kara then focuses on the voice that she had heard earlier, "You have been asleep a long time..." it says to her. Kara recognizes it to be Dev-Em's. She looks to find Dev-Em sitting in the command chair. He now appears to be much older than the last time she saw him. His hair is long, and he has a large scar that stretches from the middle of his forehead, across his right eye, and to the bottom of his cheek. Kara stunned, asks him how he got there, that he was to have been executed. Dev-Em explains that the entire council did not agree with that decision, and that he was set free by two of the council members. He explains that he snuck aboard her ship, and one by one killed all her crew. Some obviously put up a struggle, hence the scar on his face. Kara tries to run from Dev-Em, only to find that Dev-Em has full control of the ship, and manages to keep her in the control room. Dev-Em continues to tell Kara how he killed the members of the ship, when Kara strikes him with a helmet of one of the dead crew. The two of them fight, and Dev-Em discovers that he is much stronger than before, as he misses a punch intended for Kara, and hits a metal panel instead. He is stunned that he manages to put a rather large dent in it. As the two continue to fight, Kara pushes Dev-Em into a control panel, causing it to malfunction. The ships computer lets out a warning, saying that its stabilizers and navigational systems have been damaged, and that it is making an emergency landing at the nearest site. Dev-Em attacks Kara from behind, as he attempts to choke her to death, Kara manages to get a hold of the sun stone her parents gave her, stored in a compartment in the command chair, and stabs him in the hand with it. Just as this happens, the ship careens toward a near by planet, as it gets caught in its orbit. Dev-Em falls violently backwards from the torque of the ships directional change. Kara manages to get to the command chair of the ship. The ship's computer tells Kara that it has found an emergency landing site on the planet it's heading toward, and that the damage to the ship is incalculable, but has started its self repair mode. Kara assumes control of the ship, but with the stabilizers down, she must crash land the ship, instead of safely landing it. The ship then crashes into an icy surface. It skids across the ice for quite a distance before it ultimately stops. It seems that the ship has landed on a land filled with ice and snow. The snow storm in progress starts to put out the fire from the ship, caused by its entering the planets atmosphere and crash landing. The bay doors open from the ship, and a lonely figure leaves the ship, simply walking away into the icy background toward some far away mountains. We see the ship sitting in its crashed spot, and watch as time passes, and the ship become perfectly covered in snow and ice. Burying it deep below. We cut to a scene of a primitive tribe of what seem to be Eskimos, as they manage to hunt down a wild a beast for dinner. Inside the home of the tribe, we see them cook the beast, and the camera pans to the paintings on the wall. The paintings show a ship falling from the sky, and also a familiar symbol, the crest that was once worn by Kara Zor-El on her uniform. Cut to present day, we see a U.S. Government facility, where a man named Robinson approaches his senior, and explains that they have discovered a signal coming from Ellesmere Island in Canada roughly 20 minutes ago. Robinson's senior explains that there is nothing there but ice. Robinson explains that the signal is in fact coming from under the ice. They discuss the fact that the ice shelves where the signal is coming from, are thousands of years old, and what could possibly be under their. Another man that stands with the two asks "And more importantly, who is it trying to signal?". Story - 5: I haven't seen "Man of Steel" at the time I write this review, so it is coming from a perspective of not knowing anything that actually happens in the films, other than what has been shown in trailers and other footage released. So if you haven't seen the film either at the time you read this, I warn that there are possible plot SPOILERS that pertain top the film. Firstly WOW! What a way to lead up to the summer blockbuster that we have all been anxiously waiting for! Also it's littered with Easter Eggs galore! This book is chock full of story for just a one-shot. And other than what is just a cameo appearance by Clark Kent at the end, the familiar characters of whom you would expect are all but absent. The Krypton scenes don't even feature Jor-El and Lara. Though we do briefly see Zor-El and Alura. I have never been a fan of multiple creative teams on one single book. Usually this pertains to the artwork of a book, when an artist is behind schedule, and the deadline is fast approaching. The saying, "Too many cooks in the kitchen"always comes to mind. With the exception of 52, an instance where there has been more than two writers on a book is hard to recollect. There are a few writing teams in comics nowadays, but that usually just involves a pair of writers, one plotter and the other on script. I'm really proud to say that David Goyer, Geoff Johns, Zack Snyder and Sterling Gates produced a seamless story in this one-shot. If you get down to the technicalities of it all, you could say that Goyer, Johns and Snyder may just have contributed ideas, while Gates did the "actual" writing of putting pen to paper, or rather fingers to the keyboard, but I'll give credit where it's due. This was an exceptional prelude to "Man of Steel"! I really enjoyed the sci-fi elements of the story. There was genuine suspense and awe, that made it feel very much like a cinematic experience. The scenes that take place on the ship with Dev-Em and Kara, gave off a vibe similar to that of the Alien (and Prometheus) films. While the Krypton scenes were reminiscent of different planets featured in the Star Wars films. Krypton is obviously a large and advanced society that has more than just an obvious space exploration program. They intend to colonize other planets. And not the traditional way by reproducing and procreating, they intend to do this with a Codex. This seems to me, that they can grow an entire population of Kryptonians, possibly with DNA programming that has their vocation per-determined? The Growth Codex reminded me of the Krypton that John Byrne had established in his 1986 relaunch of the Superman books after Crises Of Infinite Earths. Coincidentally also named "Man of Steel", Kryptonians were not born conventionally, rather they were grown in birthing matrixs, and only when absolutely necessary. Here though, they seem to breed Kryptonians to serve a purpose. The term Explorers Guild is mentioned early in the story as Kara and the others go through their survival training, this reminded me of the New Krypton storyline from 2008. Where different guilds served different purposes in Kryptonian society. During Dev-Em's "trial," the Thanagarians are mentioned. I loved this, as it shows that this is indeed a shared universe. Also the Thanagarians are referred to as a barbaric race, and implied that they have an eye for an eye approach to enforcing their laws. This also had me believe that the Kryptonian race think very highly of themselves, and are maybe borderline arrogant to the rest of the universe. Also hints that maybe Krypton has had dealings with Thanagar, that may not have gone down in a civil way. An artifact that obviously was a call back to the "Donner-verse" was the Sun Stone. Though here it served as a holographic photograph, it was a good call back to the original Superman films. The crystals also make an appearance in the Kryptonian wilderness, but more on that in the art section. Even though this is a prequel to a Superman film, the star of this book is most definitely Supergirl! Though she is never referred to by this name, she more than earns it in this book. Without any super powers, she manages to avert her share of catastrophes. And at her graduation of sorts, she passes with the highest of honors, Krypton's "Star of Rao" award for taking down Dev-Em not withstanding. She is presented as a very well rounded character, as an obvious high achiever, but also a great future leader. This spoke volumes of Krypton's society also. As it seems that sexism on Krypton is not an issue, and male and female are on equal standing. Though one could make the argument that Kryptonians are still bred rather than naturally born, and the gender of any and every child can be engineered. Along with a possible vocation in life. I also liked that she had a love interest in the story in Kell-Ur. Even with his death, he is still continues to be a big part of her life. The Sun Stone was a nice touch. This is probably the first story that I have really enjoyed about Kara Zor-El, ever since they reintroduced her about a decade ago in the main comics. I've never really been a big fan of the character, and to get me to give a book 5 out of 5 that stars her as the main protagonist is saying a lot. Another noteworthy point is all the different Kryptonian names in the book. Nam-Ek, Dora, Thara, Dar-Enx, Dug-Les, Syra Ten-Ar, Speaker Cawl, Ho-Paa, Officer Kex, Elsi, Dac. That and the fact that the Eskimo tribe at the end of the story have Kara's family crest or rather the symbol of Hope painted on their wall along with the picture the ship crashing to he Earth. If Kara is still alive, where did she live out her life? Did she discover that she had abilities far beyond those of mortal men? Is she still alive at the time "Man of Steel" takes place? What about the other planets that Krypton tried to Terra Form? Are their more Kryptonians out there, and will they come to Earth at some point? To finish, the time line in which this story takes place is left fairly ambiguous. It could be that these events took place years, decades or centuries ago in Earth's measurement of time. And since it is unclear how time is measured on Krypton, it may have differ greatly. What is centuries here, could be decades for them?!? Another somewhat coincidental call back to Superman The Movie, where Marlon Brando's Jor-El (Holographic A.I. In the Fortress of Solitude) mistakes Earth with having 27 hours, and is corrected by Superman. And so another question arises, is Kara Zor-El still cousin to Kal-El, or is she now a long dead relative? The crashed ship is obviously what ultimately becomes the Fortress Of Solitude for Clark/Kal-El in the film, judging by what we see in the trailers. The question is, how does Jor-El's "message" and the "Super-Suit" end up in it? If in fact they are in the ship, or if Clark already has these with him? Art - 5: I cannot say enough good things about the art. I have been a huge fan of Jerry Ordway for many years. Not only did he draw one of my most favorite era of the Superman comics, but he also wrote some very memorable stories also. His art is just as good today, as it was then. In 1989, Jerry Ordway provided the art for the comic adaption of another Highly Anticipated big DC movie, in Batman. His work on that book was SO awesome, he perfectly captured the looks of all the actors involved in that film. It was like watching, or rather reading the film in comic form. If you haven't ever seen it, I urge you to track it down! I promise it will be worth it. Ordway brings the same level of excellence in his art this time around also. The only difference this time around, is that he had to interpret the look of the characters from the script that was provided to him. Save for the two images he drew of Henry as Superman and Clark, none of the characters (aside from possibly those the government facility) will be featured in the film. Ordway still pumps a lot of personality and charisma in each character of the book! I half expect to see some these characters to appear in the film. I really cant say enough good things about it! Early on in the survival training scenes, we see some familiar yet completely new takes on some famous silver age landmarks of Krypton. I speak of the Fire Falls and the Jewel Mountains. Also we all know that the Kryptonians fly on giant Dragonfly creatures thanks to the trailers. And that Krypton would have animals different and more exotic than Earth, but it's nice to see that snakes on Krypton look like snakes on Earth. The Kryptonian garments worn by nearly all the characters look very much like the pictures we have see of Henry Cavill's Superman suit. I liked that Ordway put the work in on the detail. It really goes a long way when the artist puts in 100% to make what he/she is drawing feel like the world the characters inhabit. Jerry Ordway did provide some of the inks himself, but he had help from Bob McLeod, Joe Rubinstein and Bob Wiacek. Whom all are Superman artists from the past I might add. During the first read, the difference in the artists inking styles didn't really stick out too much, and the art looked consistent throughout the book. So that was a huge bonus. All in all, I superbly drawn one-shot! Now if they only would give us an official comic adaption, with the same art team! I loved this book a lot, and honestly cant say enough nice things about it. A very praise worthy book, that deserves more than one read! Cover Art - 5: Simply Awesome! If I saw this on the shelf, I would defiantly pick it up out of curiosity! Its that good!